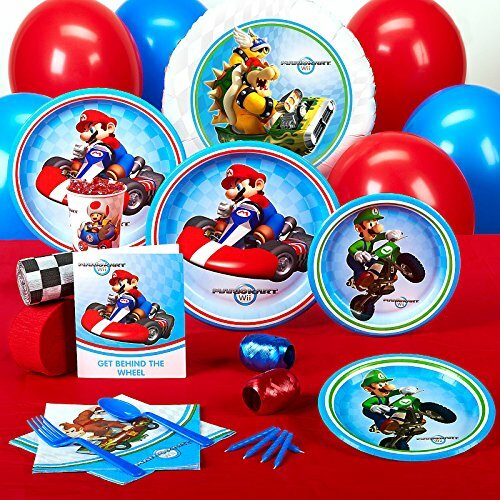 Standard Pack for 16 includes: 16 invitations, dinner plates, dessert plates, cups, forks, spoons, 32 napkins, solid-color tablecover, foil balloon, 12 latex balloons (2 colors), curling ribbons (2 colors), crepe paper rolls (2 colors), and cake candles. Make party shopping east. 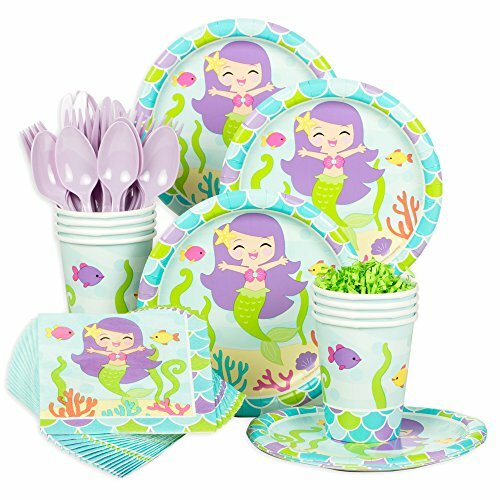 Get the Mermaid Friends Birthday Standard Tableware Kit (Serves 8) and all of the coordinating party supplies you need to make your day special. 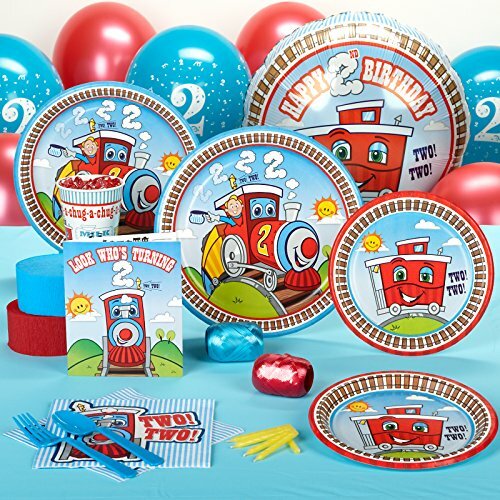 We have these items and 1000s of others for all occasions from birthdays to seasonal celebrations. Shop here and save, plus enjoy fast shipping all year round. 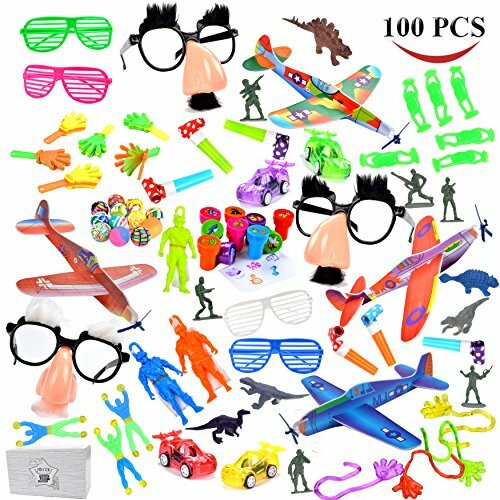 Super value high quality collection of over 100 pieces best seller toy assortments for boys is a perfect idea as party bags, party favors, and party giveaways. Teachers can use it as students classroom prize rewards box. Parents can use it as rewards gifts. Doctors and dentists can use it in children play rooms This toy set has a wide collection of many internet best selling small and mid-size toys: Disguise Glasses, Funny Glasses, Hand Clippers, Stamps, Sticky Toys, Stretch Toys, Bouncing Balls, Vinyl Dinosaurs, Military Toys, Pull Back Cars etc: 3 Disguise Glasses with 6 Paper Blowouts, 4 Kiddie Shutter Shade Toy Glases, 6 Hand Clippers, 12 Animal Stamps, 6 Sticky Hands, 6 Sticky Wall Climbers, 12 Bouncing Balls, 6 Flying Stretch Frogs, and 12 2.5" Dinosaurs Military Playset Includes: 12 8" Flying Glinder Planes, 15 2" Plastic Sodiers, and 3 4" Paratroopers, 4 Plastic Pull Back Race Cars; Toys Meet American Toy Safety Standards. The assorted items are special selected for kids in the age between 5 to 12. They will bring a lot of fun from daily play to special events like carnivals and birthday parties. It also provides one hundred stocking stuffer and easter egg filler ideas. 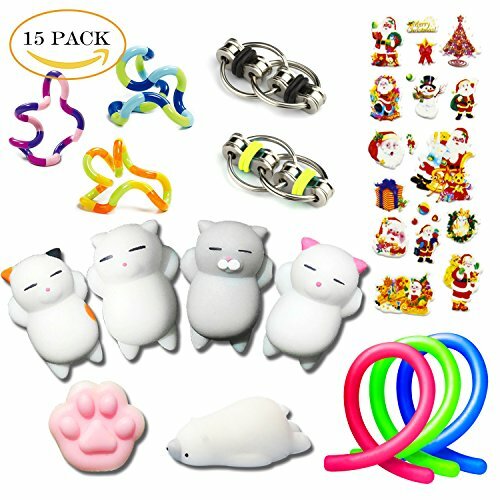 • Fidget sensory toys help relieve stress, calm nerves and increase focus for children and adults, especially those with ADHD, ADD, OCD and autism. • Ideal for parties, holidays, classrooms or as office toys. Keeps you alert and focused throughout the day and helps develop new ideas. Great for students who can't sit still. Set of 6 Animal Squishies Mochi Squeeze Toys: These squishies are amazingly soft. You will not be able to stop pinching them because of how great they feel and their squeeze-ability. Set of 2 Flippy Chain Fidget Toys: Perfect for hours and hours of non-distracting and silent fidgeting. The flippy chain doesn't distract or draw attention. Set of 3 Twisted Toys: It is twistable energy that enables the flow of creativity from your mind. Technically, it is a series of 90 degree curves, connected and able to pivot at each joint. Set of 3 Stretchy String Fidget Sensory Toys: Positive tactile stimulation and stretch and squeezes them from 11 inches to 10 feet, then bounces back to their original shape. These happy animals want to help your child celebrate her birthday! 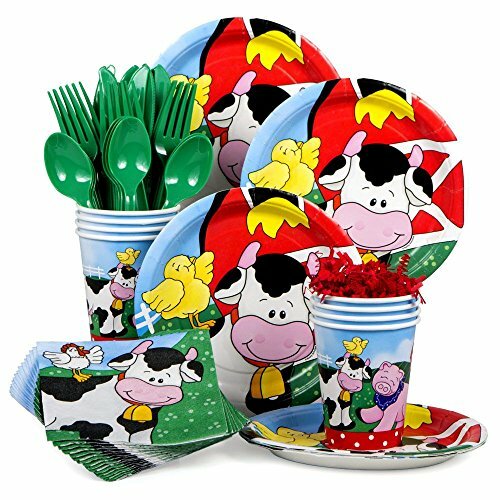 The Farm Friends Barnyard Standard Kit (Serves 8) includes 8 plates, 8 cups and 16 napkins with a friendly, smiling cow and his barnyard friends. 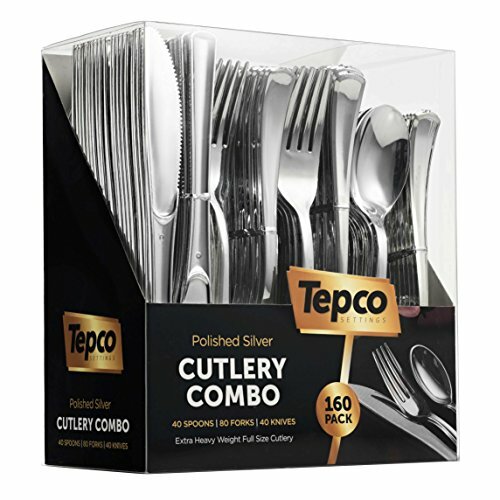 Eight green spoons, knives and forks are also in the set. Frogsac - The Brand You Can Trust!Our friendship bracelets come in a set of 6 - What you see in the photos is exactly what you are getting! We do not sell Random Mixed Bags of color variations so no need to worry about getting multiple pieces of the same style. These beautifully handmade V design Friendship Braid Bracelets are approximately 1/2" to 3/4" wide - One size fits all wrists. Great for party favors, card inserts, or as gifts to your best friends! 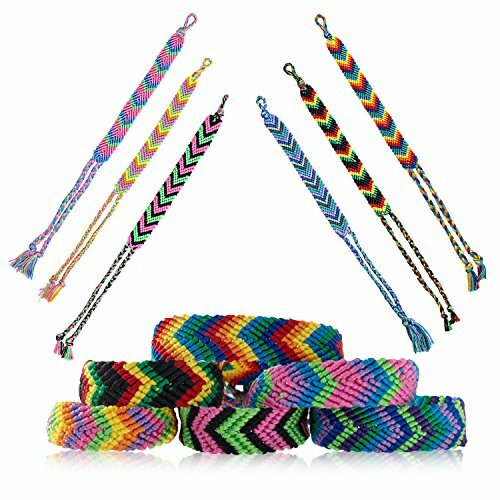 WHAT YOU GET:  6x Vibrant Hand Woven Friendship Bracelets  1x of Each Color - No Duplicates  100% Satisfaction & Money Back Guarantee! SPECIFICATIONS:  Length = 12" Width = 1/2" to 3/4" Hand Made | Hand Woven | Made With Care! 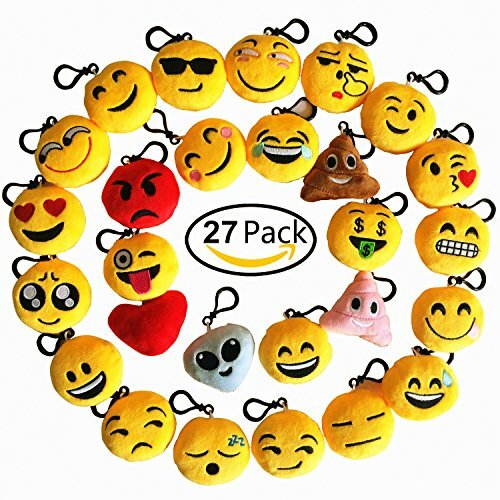 Copyright © Wholesalion.com 2019 - The Best Prices On Friends Standard Party Pack Online.